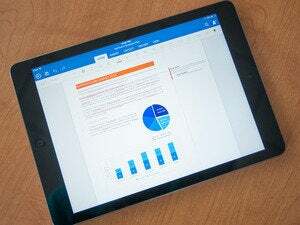 Microsoft’s Office for iPad exploded into the mobile space in March, impressing even Apple fans with its clean aesthetic. No fool, Microsoft has created Office for Android to look virtually identical to its iPad cousin, but with iterative improvements here and there. 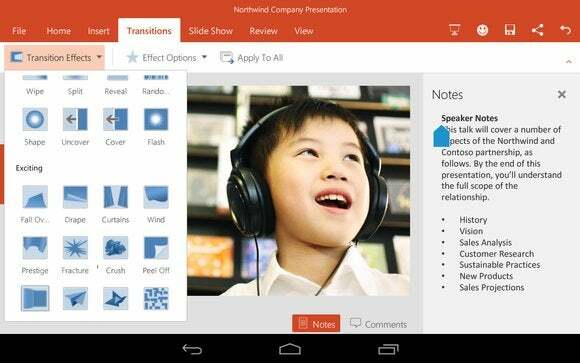 Last week, Microsoft announced a preview of Office for Android, building anticipation for its public release in early 2015. The hook this time around is that most of Office is now free on mobile, including document creation and editing. The somewhat useless Office Mobile now appears to be headed out to pasture, too. 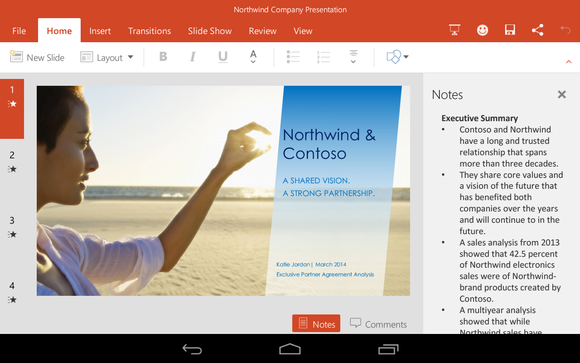 While I didn’t have access to an Apple iPad to draw direct comparisons, it appears that Office for Android Preview closely resembles Office for iPad, with at least two notable exceptions: First, users can print directly from each Office app via Google Cloud Print from the get-go; and second, users can choose whether to save directly to Microsoft’s OneDrive or to DropBox, a partnership that was announced just a week ago. After an intensive day with all three of the Office Preview apps—Word, Excel, and PowerPoint—I can already say they're outstanding, even at this early stage. They’re simply must-haves. Text editing is relatively consistent across all three apps. 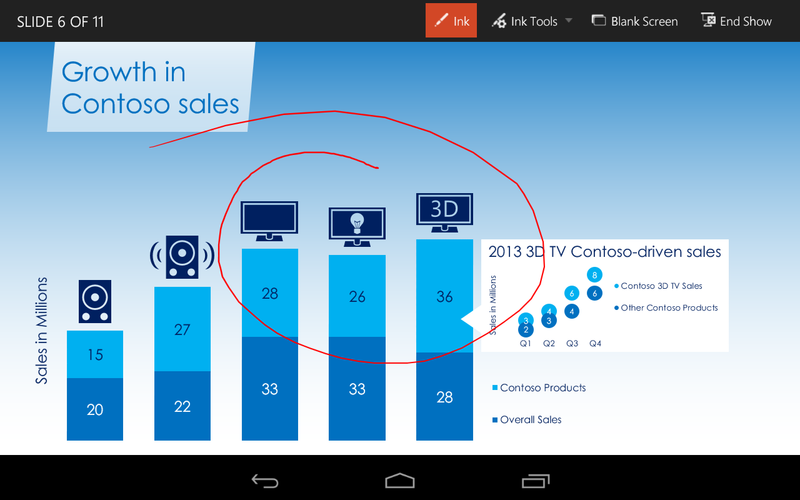 Be warned, however: Microsoft opened up the preview only to tablets with screens measuring between 7 and 10.1 inches. That covers the vast majority of tablets, of course, but excludes larger devices like the Samsung Galaxy Note Pro. And Microsoft distributed the preview via the Google Play Store, meaning that users of Amazon tablets like the Kindle Fire won’t be able to download the apps without rooting their devices. My tablet is an aging first-generation Google Nexus 7. (None of the preview apps required a paid Office 365 subscription, and all of the paid features appeared to be unlocked.) With gobs of tablet storage becoming more common, the 130MB or so each app requires is weighty, but not obtrusive. Still, the time the apps required to start up were long, on the order of several seconds, and sometimes the interface was sluggish. I’m willing to chalk that up to older hardware, however, and preview code. Since this is preview code, Microsoft would like you to share information. Take a minute and explore the settings. While the Office for Android apps ditch the paid Office 365 requirements, you’ll immediately be connected to Microsoft’s OneDrive cloud service, as well as Dropbox. Although Office apps on a PC tend to assume documents are stored locally, all three Office for Android apps also begin searching OneDrive for recent documents. Word for Android suggests twenty templates, ranging from simple letters and resumes to catalogs, or you can start fresh with your own blank document—just one at a time, however. Once a document has been opened, you’ll have the choice to “lock” the soft keyboard in place—or you can use a solution like Microsoft’s Universal Mobile Keyboard, which nestles with the Nexus 7 rather snugly. Unfortunately, a hardware keyboard is almost a necessity in landscape mode: Miss the spacebar, and chances are you’ll strike one of the Android soft keys below it by mistake. Word's layout is clean and well-organized. 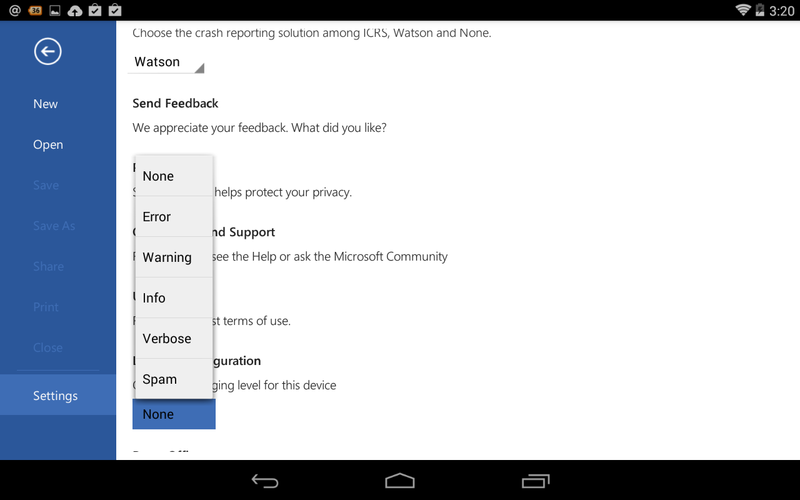 Aside from that, however, Word for Android is a real pleasure to use. Like Office for iPad, most of the commonly-used options are placed front and center, with additional complexity revealing itself as you drill down. Highlight a word, and a “...” box appears. Tap it, and you can modify the word. In Word for Android, however, you’ll only have the options to cut, copy, or paste—the “define” function that Word for iPad included is missing, as is “delete.” The menus are simplified too, with specialized references and mailings functions reserved for the desktop version of Word. In Word, you can track changes and provide comments throughout the workflow. As with the iPad, layout is relatively easy, with large touch targets providing easy fingerholds for sliding and resizing images. Text didn’t really wrap, though. Spell checking is there, under the “Review” menu, and you’ll also have the opportunity to track changes and comment on them throughout the editing process. In general, menus naturally flow down or laterally, so that you’ll never really feel like you’re trying to poke just the right pixel to trigger the correct option. The view options are limited. While Word for Android keeps the Read mode from the desktop version, you won’t be able to split windows to track multiple sections of a document at the same time. As a reporter, I confess I use spreadsheets more for tracking my personal finances or as an organizational tool than for any hard financial analysis. It’s not clear how many cells Excel for Android supports, or what the memory limits might be. What you definitely won’t find, however, is the ability to create a pivot table, those handy, dynamically updating summaries of sales totals. In the preview, you can edit the style or layout of a pivot table, but that’s one damper on the ability to create new content that Microsoft chose to impose. 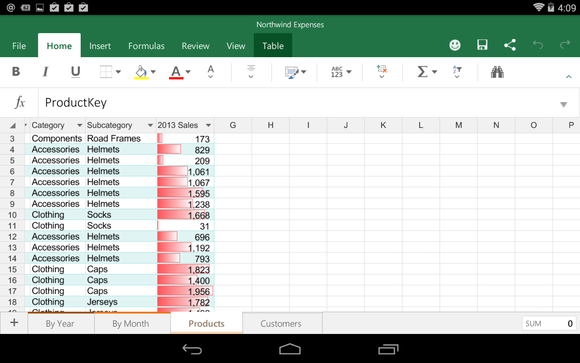 Excel Preview for Android dives deep in terms of formulas, but it reserves its more sophisticated functions for the desktop apps. Excel is probably the app that will stress your tablet hardware the most. There’s the calculation aspect, of course. Without knowing exactly what you’re doing, however, highlighting large swathes of cells by dragging isn’t that easy, despite the large touch targets. Templates are limited: Options include a basic time sheet, a template to divvy up costs among roommates, and a “video game tracker.” Don't expect to be able to pull from outside data sources, either, as you can in Excel for Windows. Once inside the spreadsheet, however, Microsoft allows you to dig deep into formulas and charts, several of which are algorithmically recommended. 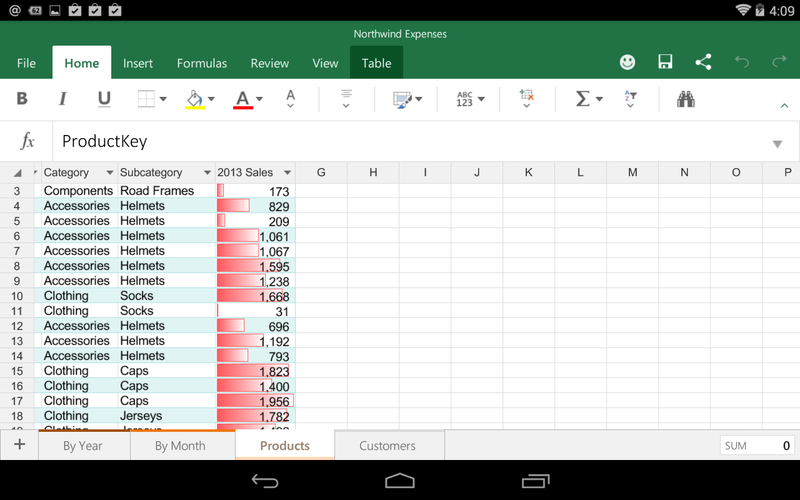 Assuming you do wish to print a large spreadsheet, Office Preview for Android allows that option. In Office for iPad, Microsoft took the time to create a customized keypad to enter data more easily. That has yet to make an appearance within Excel for Android. I tend to believe that PowerPoint might be one of the success stories in the mobile space, if only because a well-designed PowerPoint presentation relies less on text entry than the other two apps. When push comes to shove, I suspect users will be more willing to adjust some text in a slide with their finger, rather than haul out their notebook to make last-minute changes. Notes can be easily edited and stored to the right of the main slide. Essentially, PowerPoint boils down to three things: text formatting, selecting the right image, and laying out the two to best effect. (Transitions between slides seem to be falling out of favor.) Microsoft offers twenty-four attractive templates to get you started. Within each slide, text entry is similar to that in Word. PowerPoint prompts you to double-tap a text box to get started, and sliding text boxes and resizing graphics are relatively straightforward. You can also flip to presentation mode and show off the fruits of your labor, complete with digital ink. With the exception of OpenOffice and a few others, few challenge Microsoft on its own productivity turf. 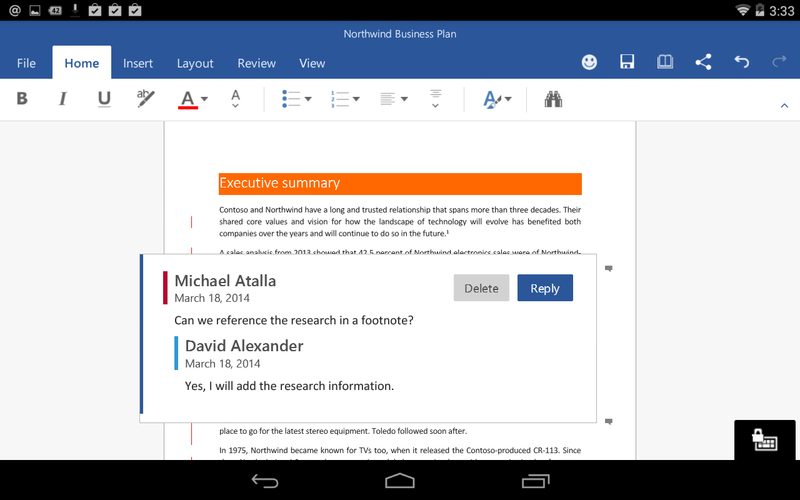 On Android, rivals include Polaris Office, Office Suite 8, and Google’s own apps. Each of those strive for the same ideals that Microsoft has: simplicity, but with increasing complexity the further one delves. I personally think Hancom Office has a chance as well. The Korean developer does a lousy job of marketing its wares on Google Play—$24, really?—but the version included on the Samsung Galaxy Note Pro is very nice, with more flexibility in certain functions—image formatting, for example—than Microsoft’s apps. Nevertheless, the tight integration Microsoft is building in with its other services gives it an advantage. And let’s face it: No one quite expected Microsoft to demonstrate such a nuanced eye for design, but it did. 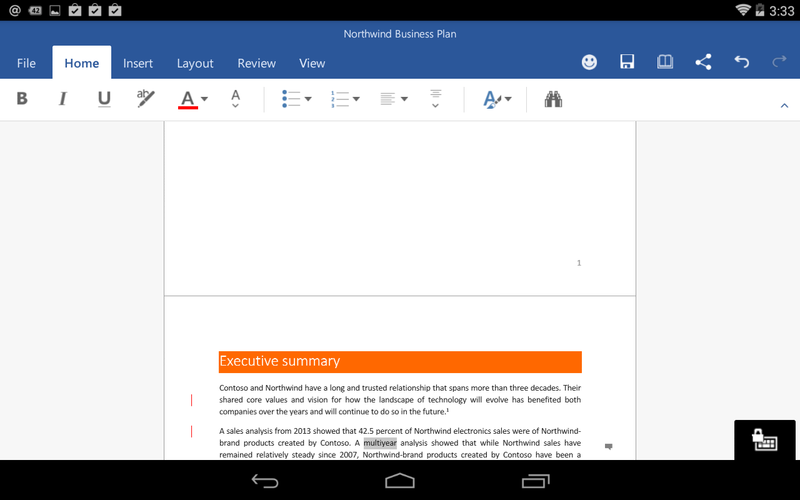 Perhaps Microsoft itself said it best: When downloading the Word Preview for Android app, the company bills it as “the real Microsoft Word app for Android tablets.” It’s right. Everything that’s come before hasn’t been up to snuff. Correction: Hancom is based in Korea, not China.